The familiar horror trope of teenagers getting lost in the woods is an interesting one, primarily because it draws on the same psychoanalytic imagery as the fairy tales we were told as children. In each case, the forest represents a place of temptation and desire, a transitional stage through which the characters must pass to achieve actualisation. 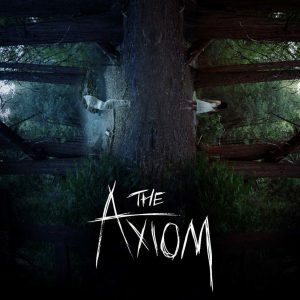 The Axiom – directed by Nicholas Woods – is the latest film to explore these ideas, adding a supernatural (and even multi-dimensional) element to these familiar narrative conventions. As such, the film is often more ambitious than it is successful, but while there are some missteps along the way, the film is put together so beautifully that these are easy enough to be overlooked. A group of teenagers go in search of a missing friend, travelling to a national park after finding clues written in her diary. When they arrive, they discover that the park is full of axioms, hidden portals to alternate realities in which predatory creatures exist. The teenagers are soon trapped inside one of these axioms, unsure of what is and isn’t real, as a host of monsters known as ‘the pale ones’ threaten to turn them against one another. The Axiom is obviously concerned with liminal spaces, not just physically but psychologically as well. As such, the film is centred around a group of characters who are struggling with their own personal development, each of them trapped in some way by their individual situations. A pair of siblings deal with the possibility of living apart for the first time; Edgar (Taylor Flowers) struggles with mental health issues; and Gerrik (Michael Harrison) hides his self-loathing behind a mask of affability. When they pass through the threshold of the axiom, these are the things which the antagonists exploit, turning the characters against themselves before coercing them to turn on each other. The scenes which focus on the psychology of the characters are the most successful parts of the film, adding a very human element to an otherwise supernatural story. Unfortunately, the most interesting characters are also the first to die, making it hard for the audience for care about the film’s denouement. Final girl McKenzie (Hattie Smith) and brother Martin (Zac Titus) are both relatively one-dimensional, having none of the psychological depth that the other characters possess. None of this – it should be said – is the fault of the actors. All five of the main actors do their best with the material provided, but the script only gives a few of them any real depth, meaning that certain characters are left feeling underdeveloped. In spite of this, each of the actors are given the opportunity to show off their abilities, though it is only Edgar and Gerrik who make the biggest impact. Edgar – struggling with his own mental health – is the most vulnerable character in The Axiom, and the film plays around with questions relating to his sanity. In one scene, Edgar finds himself chained up outside a cabin, trying desperately to persuade his friends that he is stable enough to be released. It’s a heart-breaking scene, thanks in no small part to Flowers’ performance. Similarly, Gerrik’s monologue in the woods – in which he confronts his inner demons – is beautifully paced and performed, with Harrison adding an unexpected gravitas to a character that essentially functions as the comic relief. With The Axiom, Nicholas Woods establishes himself as a brilliant director, crafting a film that feels masterfully executed, even under the constraints of a limited budget. 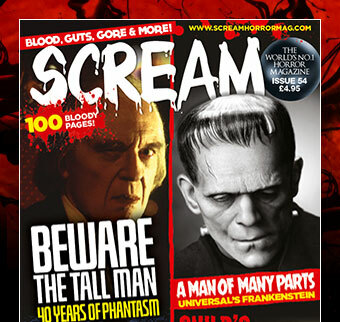 He also references many horror films throughout, macerating them to create something fresh and exciting. Of course, there are shades of The Blair Witch Project and Evil Dead, but more interestingly, Woods references Refn and Argento in the design of the final axiom. Similarly, there are other interesting design choices made throughout the film, adding a subversive twist to something which could easily have seemed rote. The way we know we are in the axiom, for example, is by having a drift of cherry blossom fall languorously across the screen. This is a subtle and elegant way to establish things to the viewer, and it’s these moments that really make the film come alive, especially as it becomes progressively more supernatural. On the other hand, the design of the creatures is one of the weaker parts of the film, and The Axiom suffers from the fact that we simply see far too much of them. 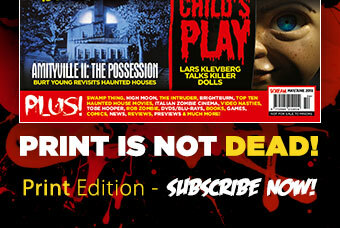 In the opening scene, a girl is forced into the portal where she is swiftly killed by a monster. This creature is seen only partially – the pallid skin, the impossibly long arms – and because of this, the opening scene is the scariest in the film. After this, the creatures suffer from a lack of creativity; we soon discover they look like extras on a ghost train. This wouldn’t be such a problem if we only ever caught glimpses of them, but we see them far too often to be genuinely atmospheric, and really, lank hair and smudged eye liner lost some of their efficacy after The Ring. 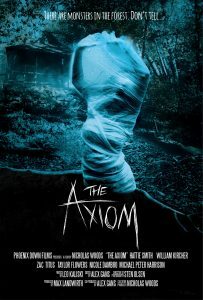 The Axiom is an interesting film, one that attempts to subvert some of the more predictable tropes of the horror genre. Admittedly, this doesn’t always work, and the film largely falls apart once the interesting characters have been killed off. But, when considering that this is Woods’ directorial debut – and that the cast have only been in a handful of films between them – the result is nothing short of extraordinary. Fans of supernatural horror will undoubtedly find lots of enjoy here, but even for those who aren’t, Woods is certainly a talent worth watching out for in the future.